PHOENIX – Mosquito complaints in Maricopa County are at an all-time high, leading officials to use a technique called “fogging” to reduce the insect population. Mosquitoes are first trapped, and if any are infected with West Nile virus, the area is sprayed with pesticide. Officials say that although it is a chemical-based method, fogging is safe for residents and pets. 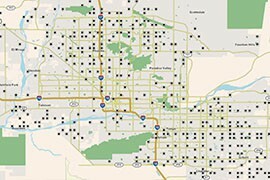 Click the map to find out if your area has a mosquito trap site.